One of the many challenges of colonizing Mars is that the planet is lacking many of the natural resources we rely on here on Earth. We’ll need to bring as much of what we need to survive as possible, but you can only pack so much into a spaceship. So scientists are developing ways to utilize at least one of the red planet’s most abundant resources: dust. We’ve had a hard time coming up with reasons as to why everyone needs a 3D printer here on Earth, but on Mars the machines could be used to manufacture tools, spare parts, even entire structures, habitats, and vehicles, given there’s no hardware stores for astronauts to visit if we eventually send humans on the 34 million mile journey. But 3D printers don’t make things out of thin air. You’ve probably seen an affordable consumer-friendly 3D printer at work, melting and extruding thin lengths of plastic to build up a model. There’s no plastic on Mars, however, and packing miles of filament on a ship takes up valuable space that could be better used for transporting oxygen, water, and other essentials. 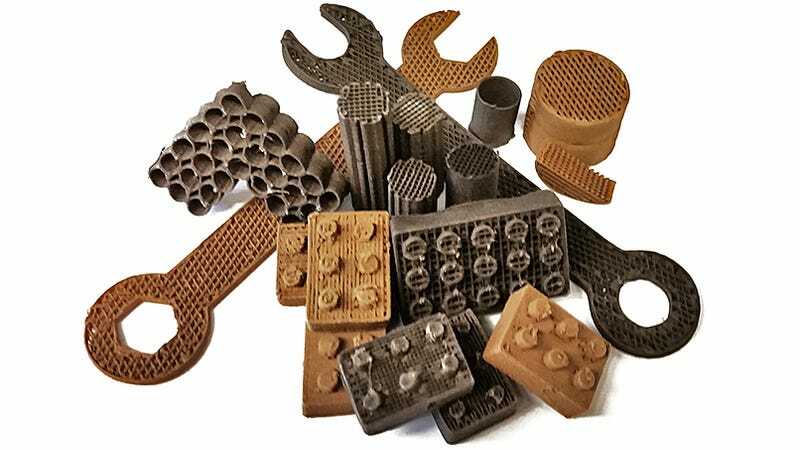 So scientists at Northwestern University’s McCormick School of Engineering have developed a way to turn extraterrestrial materials, like Lunar and Martian dust, into a 3D printing material.